On the dimly lit and sparsely furnished stage of Edinburgh’s Pleasance Theatre appears Mrs. Gamp, an alcoholic midwife charged with watching over a dead body. She commands the audience’s attention from the opening word of her drunken monologue, which flows effortlessly from humor to pathos, until she slowly settles into a chair and falls asleep. Her performance lulls the audience so perfectly that we’re almost surprised when ‘Mrs. 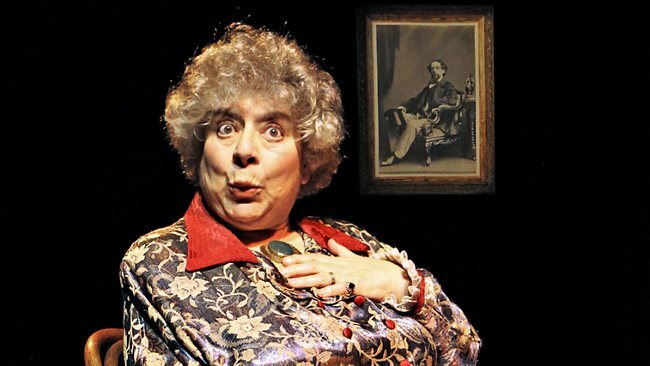 Gamp’ (a character from Dickens’ lesser-known Martin Chuzzlewit) springs back into sobriety and reveals herself to be Miriam Margolyes, the veteran actress and national treasure behind the one-woman show Dickens’ Women. The show premiered at the Edinburgh Fringe back in 1989 and has since toured the world, and in 1992 received a nomination for the prestigious Olivier Award. Now, in the year of Charles Dickens’ bicentenary, Dickens’ Women embarks on another worldwide tour, including a month-long run in its hometown- a welcome change from the tedious lectures and contrived novel re-releases which usually accompany centenaries and the like. In the ultimate example of ‘if you want something done right, do it yourself’, Margolyes tells the story of Dickens via 21 female characters (and a couple of blokes) from his works. The characters were inspired by the troubled relationships Dickens had with the women of his life; from grotesque drunks to delicate ingenues to tragic spinsters, a lot can be deduced about Dickens from the characters he created. Indeed the character of Miss Havisham, Margolyes argues, is the character who most closely resembles the author himself. Not only is the play a testimony to the elastic acting talents of Margolyes, who transforms so completely and convincingly into every character she plays, but also to the genius and imagination of Dickens. Margolyes’ passion for Dickens derives from the lessons his literature teaches; Dickens believed that literature is not peripheral to life, but the stuff of life itself. This is the lesson Margolyes hopes to relay to her audience, which is younger than even thanks to her role in the Harry Potter films, and in a time where recession is leading to the closures of libraries, theatres and galleries, it’s a message that’s never been more important. If anyone ever accused Dickens of being dull, Margolyes would certainly change their minds. In one scene, she plays both Miss Corney, the workhouse matron from Oliver Twist, and the beadle Mr Bumble at the same time and completely convincingly; she has the fantastic ability to change character with simply a change of expression. With sparse props, no costume changes, strobe lights, smoke or mirrors; Margolyes is able to charm the audience with just her formidable talent, just as Dickens was able to enchant with just words. Dickens’ Women is in Edinburgh until 25th August; for tickets and Scottish tour information, click here.